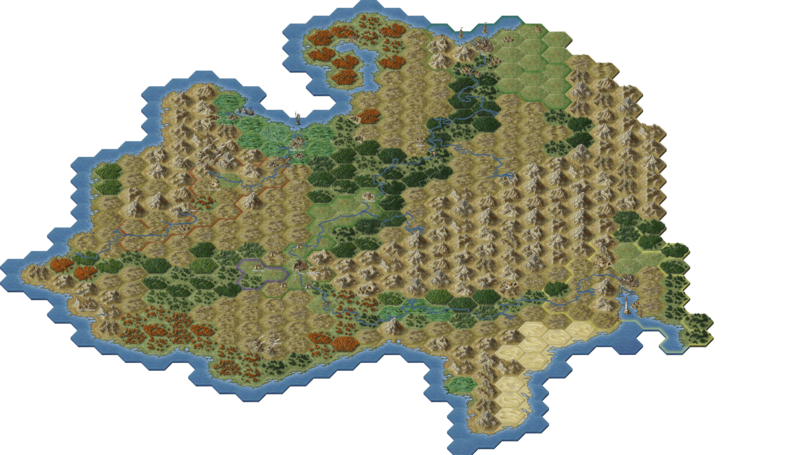 I’ve had the great pleasure of playing with the alpha test of Fantastic Maps #HexAllTheThings. If you want to break the tool sign up here. The first thing I did to break it was make a larger than expected map of the Western Wildes, or those cities and towns that are primarily influenced by The Everflow. Telse, Mira, Qin and the other cities near the Everflow and its two rivers. This image doesn’t include the Fog of War functions, nor the ability to see descriptions as part of the labels as the web version does. Thankfully for me, the region is temperate and mostly green trees. So the earliest of releases looks like what I want the area to look like. You can see the North River and South River coming out from the Font of Two Paths. There is also the devastation at the Ruins of Sheljar. That city didn’t handle the Awakening well. Though it’s only been 21 years the influx of cantrips into this city in the swamps lead to fighting and destruction. The area has been abandoned as many of the bridges, dikes and other bulwarks were destroyed. There are also now massive waves pounding the shores of Sheljar Bay. Those that followed the story of The Five will see the Glass Tower and the encampment where the Cult of Nak took residence. I used regional shading there to show areas that were effected by the volcano that Scholar Cortez set off. Along the road is the West Gate where Obsondites took over. There is regional shading there as well. Mira and Qin get some attention, but since their outlying communities are not common knowledge to the people of Telse they get no labels. Three of The Five are from Telse and its environs. Shonee grew up in the town itself. Aamar spent some time in the uplands discovering his faith. Mo hails from Fort Ooshar, a former Sheljar tax collecting town that Telse now controls so that their goods can get to Mira unmolested. Qin is defined by it’s massive harbor, the lighthouse and the Cannons of Qin. Those two towers at the mouth of the bay prevent attack from the sea. The road through the uplands is hard travel, and many will take the South River upstream on pole and paddle. Mira has more outlying towns and towers. With it being much closer to the River Crinth it has to use more of its might to prevent invasion and refugees from the Crinth/Azsel wars. There’s also an odd peninsula that I made just to test out how the automatic shorelines worked. These are fairly simple maps at this point. I used a scale of 24 miles across, because I wanted a moderate day of travel per hex. The scale change and actual gaming forced changes from my first hand drawn map. I’ve now started working on two other regions where other characters originate. Gate (Samul, Behn) is nearly done. The lakes along Crinth where Mansaray is from are still being developed, and may need to wait for more features.